The City of Maricopa Parks, Recreation and Libraries Department is holding its fifth season of youth soccer. Registrations for the 2007 fall season will begin Monday, July 30, and end on Friday, Sept. 28. All games will be played either Saturday morning or Saturday afternoon based on the total number of teams registered. Teams will practice one to two times per week. The new program will feature skill-by-age categories for 4-6 year-olds, 7-to-9 year-olds, 10-to-12 year-olds and 13-to-15 year-olds. 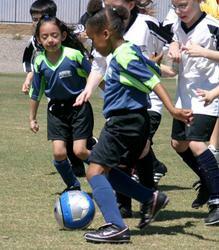 All children in the 4-6 year-old age group will play co-ed soccer. All children registering in the 7-9, 10-12 and 13-15 age groups will play in boys only and girls only leagues, a new feature for the fall season. The registration fee of $45 includes seven weeks of games, a soccer jersey, soccer shorts, soccer socks, a trophy and end of the season reward. All coaches will be put through an in-depth training program, and practices will be one to two times a week starting the week of Oct. 8. Practice times and days will begin after 5 p.m. Monday through Thursday. The actual practice day and time will be left up to each team to decide.